One of the oldest Jewish families in Prague; probably "Falkeles" originally, from "Falk," a common name among Jews of the sixteenth and seventeenth centuries. The name occurs with various spellings (as "Felkeles" and "Falkenes") on old tombstones in the Jewish cemetery of Prague (see Hock, "Die Familien Prags," 1892, s.v. "Presburg"). The only known attempt to construct a family tree was made by R. Eleazar Fleckeles, who traced his ancestors to the ninth generation as follows: Eleazar (1723-98) b. David b. Wolf b. Shalom b. Selig b. David b. Wolf (d. 1672) b. David b. Wolf. The last-named was a son-in-law of David GANS, and is mentioned by Heller in Tosafot Yom-Ṭob on Kilayim 3, Mishnah 1. From the above-mentioned work of Hock it seems that Wolf was the son of David b. Judah, who died in 1602, and who had another son, Hirsch (d. 1605), and a daughter, Pessel (d. 1636). The Fleckeles family was connected by marriage with that of R. Löw of Prague and that of R. Heschel of Cracow, as well as with other prominent families. 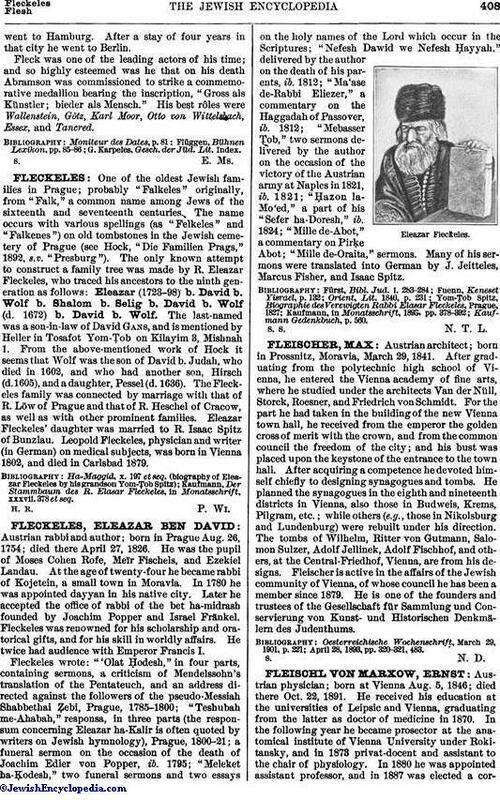 Eleazar Fleckeles' daughter was married to R. Isaac Spitz of Bunzlau. Leopold Fleckeles, physician and writer (in German) on medical subjects, was born in Vienna 1802, and died in Carlsbad 1879. Kaufmann, Der Stammbaum des R. Elasar Fleckeles, in Monatsschrift, xxxvii. 378 et seq.